Verb Bingo is based upon the traditional bingo game. It allows students to memorize 66 verbs in a pleasurable and fun way. The verbs are part of different lexical areas: sport, free time, school, daily actions. 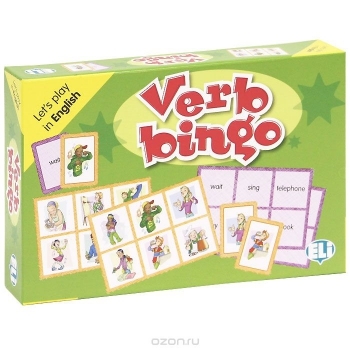 Verb Bingo includes a pack of 66 cards that present a picture showing the action of a verb on one side and the corresponding verb written on the other side. The game is composed of a further 36 bingo cards, each of which contains 6 pictures from the deck on one side and their respective verbs written on the other side. The instructions contain suggestions and useful ideas for a wide range of games and activities ™ that can be carried out in class or at home with friends. В комплект входит 66 карточек размером 6 см х 8 см и 36 карточек размером 16 см х 11см. Размер коробки: 21,5 см х 14,5см х 3,5 см.